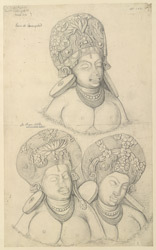 Pencil drawing of sculpture details from Cave 7 at Aurangabad by Jayrao Raghoba (fl. 1875) in March 1876. This image is from an album of 106 drawings of plans, sections, elevations, sculpture and architectural details from sites in Hyderabad and Bombay. The drawings were prepared mainly by Indian draftsmen under the supervision of James Burgess of the Archaeological Survey of India. Situated at a height of 700 feet in the Sahyadri range of the Western Ghats two miles to the north of the town of Aurangabad are a series of Buddhist cave temples carved into the mountainside. They are arranged in two main groups approximately a third of a mile apart. All, except number 4, are attributed to the period of the Vakataka (fourth and fifth centuries AD) and Kalachuri (sixth to eighth centuries) dynasties. There was probably a long and continuous occupation of the site by Buddhist monks and their lay supporters. Cave 7, dated to the 6th century, is often regarded as the finest of the caves at Aurangabad. The basic ground plan of the cave is of a circumambulatory path around a square shrine housing the Buddha who is in the preaching attitude. The shrine is surrounded by slightly tapering columns with square bases and lotus and half-lotus medallions and large panels in which bodhisattvas guard the Buddha in the shrine. The cave has many images of women such as Hariti, the goddess of prosperity and patroness of children and the six goddesses including Padmini. This drawing shows the goddess Tara (literally ‘Star’) and her attendants with their elaborate headdresses decorated with flowers, ropes, pearls, diadems, jewellery and the crescent moon.